Of late, Indians have been turning their backs on the crowds at the Colosseum and Pantheon, and heading north, to the vistas and vineyards of Tuscany. We asked a few of our favourite Chennaiites, who recently holidayed in the region, how to make the best of the art, wine trails, cuisine and culture in the area. And if that werena��t enough, cartoonist Biswajit sketched us his opinion, too. On her 60th birthday last year, Vidya Singh didna��t sit around eating cake; she went on an eight-day cycling holiday in Tuscany that her children had gifted her. a�?Ita��s a great place to cycle as it is full of vineyards, olive groves, beautiful villas and the visuals are spectacular,a�? she says. a�?But you need to be very fit as the whole area is hilly.a�? The holiday was planned by Giro Libero, a bike tour organiser. a�?Theya��d give us the daya��s route (with distances, heights, etc) and wea��d head out after breakfast,a�? Singh explains. The three took their time cycling, stopping at olive farms for tastings and to see how the oil was pressed. a�?Or wea��d stop at a vineyard for a walk through. Wea��d also pick up a bottle of wine, find a shady tree and enjoy a drink,a�? she reminisces, adding that the city of Siena was her favourite. an impromptu violin concert outside a church and dined in a town square during a local fashion show. 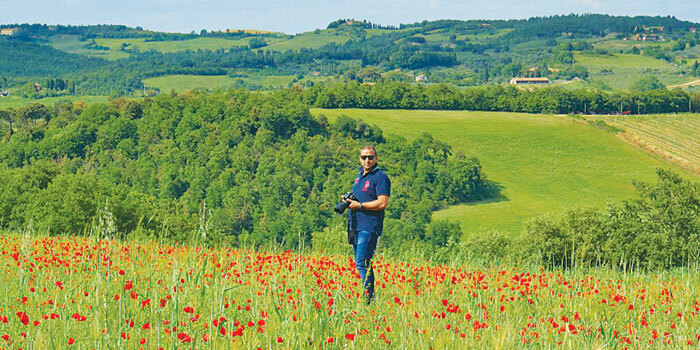 While adman and photographer Sharad Haksar did pack his camera, his recent holiday to Tuscany was not about finding the perfect frame. It was about family time, exploring the Italian countryside and tasting the local cheeses. a�?The best way to experience Tuscany is by road. So hire a car,a�? says Haksar, who stayed in Montepulciano, a town in the Siena province. a�?I prefer the smaller towns, built on hilltops, which have so much character and unreal vistas,a�? he describes, adding that one must visit the artisanal shops, a�?where people work with silver and ceramic.a�? And when they were not exploring, they were eating. While his daughter worked her way through plates of pasta, Haksar says he gorged on pizzas and cheeses, loving the fact that a�?everything was homemade.a�? He suggests that travellers book rooms at local villas. a�?The people are warm and the serviced apartments beautiful,a�? he shares. If therea��s anything to be careful about, ita��s where you park your car. a�?You may see a parking board, but it could be just for residents. So double check as the penalty is steep,a�? he says. Ita��s no surprise that Vipin Sachdeva��s holiday was all about eating and drinking. But the owner of Tuscana insists that, while the food was great, a�?Therea��s nothing to beat the pizzas we serve.a�? His driving holiday with his wife and two daughters panned out very organically. All they took was their luggage and his TomTom (car GPS system). a�?We drove from Florence to the Chianti region. We didna��t plan which town to stop at; we went by gut. If we liked a villa in a vineyard, wea��d get a room. Then wea��d spend the day driving to nearby towns,a�? he says. However, Sachdev made sure to stay away from touristy trattorias. Instead, hea��d ask locals where they ate. a�?Before we sat down, wea��d make sure it was full of locals and that the waiter didna��t speak English,a�? he chuckles, adding that they tasted everything from risottos, pastas and pizzas to a variety of desserts, the staple being tiramisu. a�?Wea��d also ask the maA�tre da�� for wine recommendations,a�? says Sachdev, who loves his whites. His only word of caution: dona��t over speed. a�?You will get caught and the penalty is very high (around 175 Euros),a�? he explains.